Brandwatch, a social media monitoring tool, has just launched an interactive page giving insight into the kind of buzz generated about the 36 brands that also happen to be Super Bowl sponsors. The tool is, however, built using Flash. Each brand is represented by a helmet wearing worm who pops out of a groundhog-like hole when you hover over it. The interactive page is quite entertaining and will probably have you whizzing around your screen, reading the latest tweets related to these brands, including GoDaddy, Hulu and e-Trade. You can come away with all sorts of interesting information about the 36 brands – including who has generated the most buzz on Twitter in the past 28 days, and how much of that buzz has bee positive or negative. At a glance the chart on the site shows you who’s coming out on top with the leaderboard of brands, the number of tweets they’ve each received,a small graph showing the trends throughout the month, and lastly, gives you an idea of the positive/negative feedback. The brand topping the list at the moment is Volkswagen with over 13,000 tweets about the car brand in just under a month. A little pie chart shows the sentiment of the tweets, and as with most brands, the vast majority are neutral with a small slice of positivity. Hovering over the Volkswagen worm will give a day-by-day blow of the buzz, as well as more info on their ad campaign spending, and a word cloud from the tweets. Over all, Volkswagen has received 7% positive buzz, 1% negative and 92% neutral. On January 9th, Volkswagen must have done something good because their positive buzz boosted to over 75%. Taking a look back at Volkswagen’s own official tweets, on January 9th, the company revealed two new cars, the Hybrid Volkswagen Jetta and the E-Bugster, a Beetle with an electric motor. In addition to brand-related tweets, you can also get a little bit of insight into stories coming out of the UK and US media outlets, although as to be expected, there are only just over 200 tweets coming out of UK news sources. Brandwatch has even set up a little cheerleader feed, where any tweets tagged #bwcheerleader will appear. Every year, the Super Bowl presents one of the most prestigious advertising opportunities to global brands. In 2011, 46 minutes of network ads were shown during Fox’s telecast of Super Bowl XLV. But the centre stage doesn’t come cheap. Over the past 10 years, advertisers have spent $1.72 billion on the Super Bowl and this year a 30-second slot will set back brands $3.5 million. We’re asking – can the impact of ad-spend be measured by online buzz? It’s interesting to see that with all that money spent, it simply isn’t paying off for some brands. At least not on Twitter. Sketchers spent $3.5 million on ads and the feedback on Twitter has been 1% positive versus 10% negative. With the Super Bowl just days away, there’s obviously been quite a lot of hype about it online. There’s been quite a lot of buzz generated about the two teams that are going head to head, while Samsung will be taking advantage of the Super Bowl hype to launch a brand new phone in the middle of the game. The Samsung announcement doesn’t seem to have piqued Twitter users interests, with the brand coming in at the 7th spot on the leaderboard. 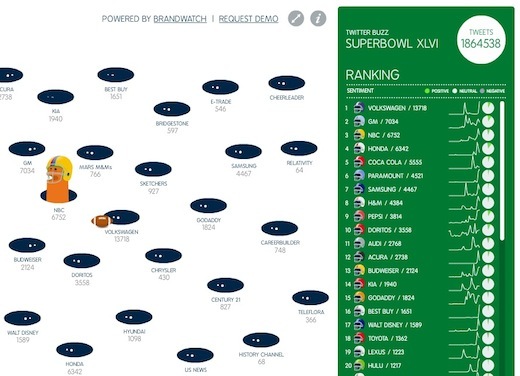 ➤ To find out more about how Twitter is buzzing about Superbowl brands check out, Brandwatch Superbowl 2012.